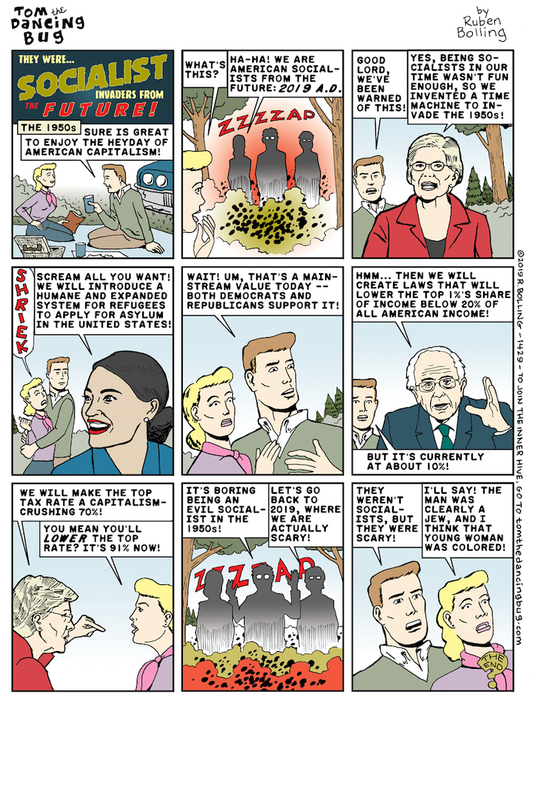 As cartoonist Ruben Bolling explains, for all the scaremongering by right-wingers, the people who today are advancing in the US policies on taxation that are branded as socialist would be seen as far too timid by their predecessors in the 1950s. The problem is that the Right (whether in their “conservative” or “libertarian” façade) has been shrieking “Marxist!!!/Communist!!!/Socialist!! !” at every tax and regulation since the Great Depression. Now, even the mildest attempt to rein in the chaos caused by Republican (aided and abetted by some Democrats named Clinton who will remain nameless) efforts to gut the federal government and shred what little social safety net we have left. We’re often told by “pragmatic” Dems that social change needs to be slow and deliberate. The trouble is that the economy and environment have gotten so bad thanks to the Right and their Centrist allies that slow plodding change when it’s politically convenient is a luxury that only privileged, upper-class, limousine liberals can afford. We working class peons will all be dead before any significant progress is made. Yup. President Eisenhower was an evil commie. Dems’ tempo: one step forward, three steps backward. This is why I asked yesterday: what if there is no candidate I would prefer?